If you are selling products and services, or collecting information on your website – you have cart abandonment. Now, cart abandonment will happen no matter how beautiful you make your site or how you target your audience. However, that does not mean you can just write it off, it can always be optimized. 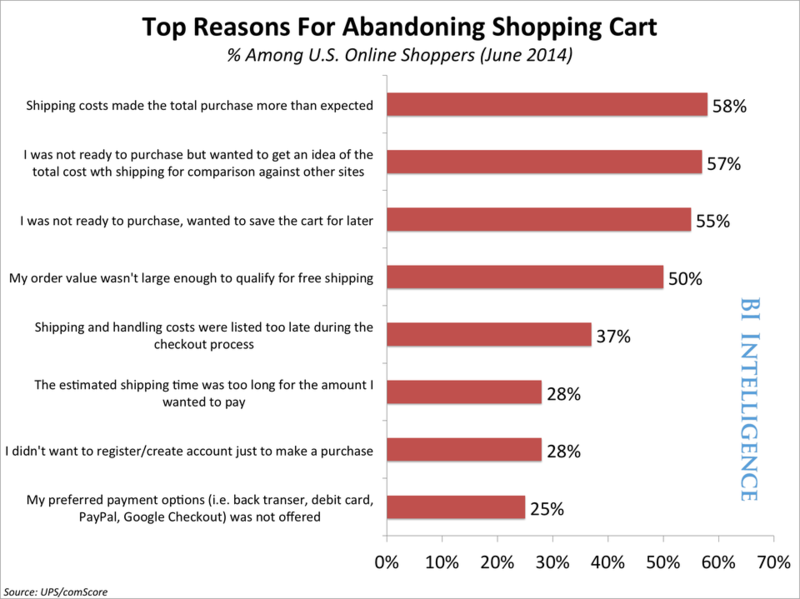 Why does Cart Abandonment occur? According to Business Insider, the number one reason people abandon their carts are due to unexpected changes in pricing, which usually happens when the shipping costs increase the total price. Another common reason for cart abandonment is when shoppers have to jump through unnecessary hoops. If you require users to sign in or create accounts to purchase or fill out information, you’ve created another barrier which will make cart abandonment rise. Every page you make people click through will lead to higher cart abandonment. Shoprocket has a solution for eCommerce which allows people to make purchases without ever leaving the page. If you’re delving into conversion rate optimization for your digital property, cart abandonment is often the highest-impact, lowest-cost place to start. The first step is to understand why customers are abandoning their carts. There’s a variety of tools that allow you to analyze and test your digital properties such as VWO, but a strong grasp of Google Analytics is all you really need. In addition to a tool that allows you to analyze data, you will also want a tool that allows you to recover abandoned carts. CartHook is the leader in this space, and allows you to build an automated email campaign that is sent to users that type in their email address on the checkout, but don’t end up converting. So, you’ve picked up VWO and CartHook, but you’ve only just begun. What if a user gets to the checkout page but leaves before they type in their email address? CartHook won’t be any help in these situations, but a retargeting campaign will do the job. You’ve now got the tools to measure and recover, but you also want to stop people from leaving in the first place! How can I change my site to lower Cart Abandonment? You can most effectively determine why people are leaving your site by looking at visitor recordings in VWO, but here’s some popular fixes that consistently lower abandonment rates. As I mentioned, the number one reason people abandon their carts are due to unexpected changes in price. Be upfront about the final price- you should build in tax, shipping, and any other fees into your sticker price. The tricky thing about being upfront with your total price is that you’ll likely have less people click through to the checkout page (if it’s more expensive) in the first place. Instances like this are why it’s so valuable to use a tool like VWO to run A/B tests, and analyze user behavior to see which variation is converting more. Every extra form you require people to fill out is going to cause cart abandonment to rise; less is more when it comes to your checkout process. This is a difficult line to walk- the more information you can get, the more valuable a customer becomes. One common solution is to send a follow up email once they’ve converted. Receiptful is a popular eCommerce tool used to upsell and mine more information within the customer’s receipt… which, by the way, is the most opened email in all of eCommerce. When it comes to your checkout page(s), get it all done in one page. One of the most common mistakes made is a finalization page. If you get all of a user’s shipping & billing information, then take them to a page to ask them if they really want to make the purchase, you should expect a high cart abandonment. Stripe’s integration with Amex is a must-have for eCommerce. This allows Amex customers to make purchases on any platform without the need to enter billing information, similar to Amazon’s one-click checkout. If your eCommerce site is not entirely https, that needs to change immediately. An SSL certificate is the most prominent, and easiest trust signal to display across your site. In addition to SSL, your checkout page should also have trust signals, such as a guarantee, or Google’s Trusted Store indicator. Unless you are taking your user to Paypal for checkout, your checkout page needs to look identical to the rest of your site. Continuity is essential, so make sure your UX, color palette, and design elements are the same across every page. If users don’t recognize the same brand elements or user interface, or if they’re taken to a new URL for checkout, you’re going to experience higher cart abandonment. Nowadays, there are dozens of different payment methods for people to choose from. It is up to you, the merchant, to accept as many as possible. Otherwise, people will use your competitor’s site which does accept the method they want to use. The majority of these payment methods cost nothing (monthly) to accept, and all have competitive rates. Test, analyze, refine, repeat. Conversion rate optimization is not about gut-feelings and anecdotal evidence. It’s about developing a hypothesis and putting it to the test. If your results are not mathematically significant, you’ll need to buy traffic so you have a larger sample size, or make more significant changes. If you’re not familiar with conducting conversion rate optimization campaigns, I strongly suggest using a tool such as VWO or hiring a firm that knows what they’re doing (cough). There’s not much worse than putting in all of the effort to optimize your site only to end up worse than you started off.